The Black Friesian horse is immensely popular and used in various branches of equestrian sport. Both as a riding horse and as a driving and harness horse the Friesian can deliver great performances. As ancient texts testify the Friesian has served humankind for many a century. At the start of the Christian era, the Friesian was used in battle and Friesian troops were documented in Britannia. In the 4th century, English writer Anthony Dent wrote about the presence of Friesian troops at Carlisle. They had their own horses. Both cases probably involve Friesian mercenaries mounted on Friesian stallions. Anthony Dent and other writers indicate that the Friesian horse is the ancestor of both the British Shire breed and the Fell pony. 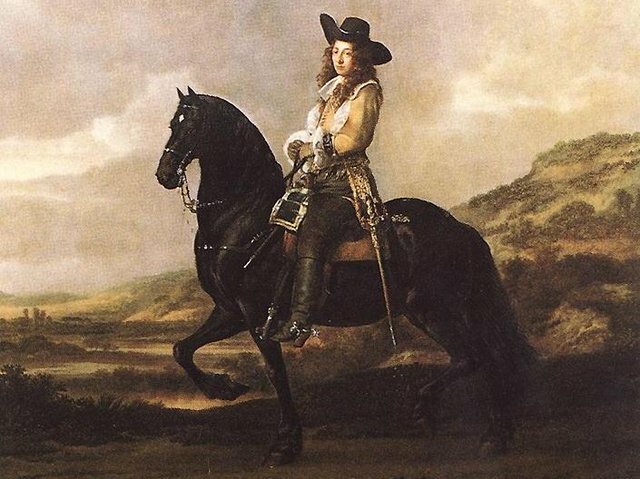 In the 11th century, Willem de Veroveraar used horses that had a remarkable resemblance to the Friesian breed. From this period, many illustrations are known of knights riding Friesian-looking horses. During the crusades and later, in the course of the Eighty Years War, it is very probable that the Friesian breed was crossed with Arabian and Andalusian horses. The first written evidence of use of the name ‘Friesian horse’ is an announcement in 1544 that German Elector Johann Friedrich von Sachsen came to the Reichstag in Spiers riding a Friesian stallion. 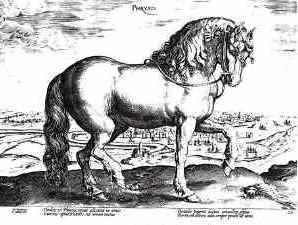 Three years later, he rode the stallion in the Battle of Muhlberg and was recognised from afar by Emperor Charles V.
The etching, dating from 1568, of the stallion Phryso belonging to Don Juan of Austria in Napels is of course very well known. During the 17th century, the Friesian horse was well represented at the various riding schools where the haut école of equitation was practised. Use of the Friesian horse, however, became increasingly limited to the current Dutch province of Friesland over the 18th and 19th centuries. Towards the end of the 19th century, the presence of the Friesian horse in the countryside of Friesland became mostly an expression of the owner’s wealth, with the breed used mostly just to bring the upper-class farmers to church. The horse was additionally used for entertainment, in the form of ridden short-track trotting races. In these races, the horse was traditionally ridden with just a small orange blanket on its back. During this period, the Friesian horse was very likely used in the breeding of the Orlov as well as of American trotters. At the end of the 19th and the start of the 20th century, a very difficult period ensued. The Friesian horse had to compete with the heavy horse breeds. The dancing ‘show horses’ of the landed farmers were in fact less suited for heavy work. Farmers finally switched over to the heavier breeds or crossed the Friesian horse with these breeds. This proved almost fatal for the Friesian breed. On 1 May 1879, in a tavern called 'De Drie Romers' in Roordahuizum, the Friesch Paarden-Stamboek (the studbook of the Friesian horse) was established. Registration of the Friesian horses that still remained proved somewhat of a stimulus to the breed, but the popularity of the heavier breeds, the so-called ‘Bovenlanders’, nonetheless continued to undermine the Friesian, and by the start of the 20th century the breed was again dwindling rapidly. In 1913, there were only three older studbook stallions available for breeding. Fortunately in Friesland there were people who wanted to save the native Friesian horse breed from extinction. They breathed new life into the breeding, by implementing a well-considered strategy for buying and rearing the still-existing, qualitatively good, purebred colts. The strategy succeeded, and the Friesian was saved from disaster. Next to its fantastic exterior, the Friesian horse’s character is marked by friendliness, intelligence, adaptability and an enormous willingness to work. It is this character especially that has drawn people, throughout history, to be willing to go through fire for the breed. ‘Supporters’ of the Bovenlanders were often unnecessarily harsh in their judgements of the Friesian horse: They were said to ‘dance’ too much in front of the plough and therefore to waste useful energy. In actuality, they was some measure of truth in what they said, but they failed to appreciate the history of the Friesian horse and the profound affection between master and horse that is so often seen with the Friesian breed. 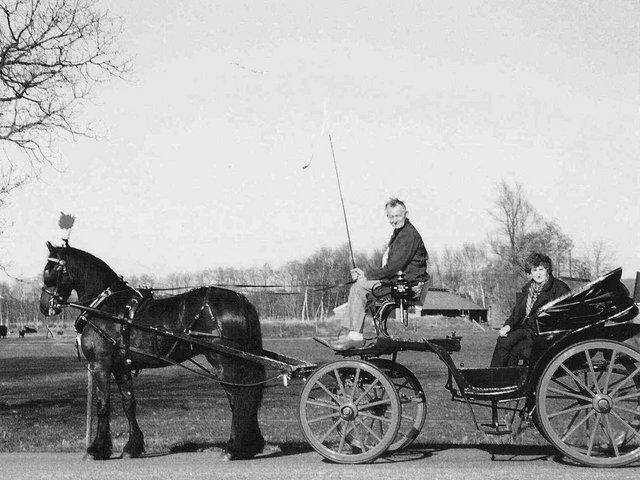 After 1913, no other choice was left: The Friesian would have to be able to compete with the Bovenlander. Some of the breed’s erstwhile luxuriance was compromised for more horsepower. The Friesian therefore became a bit smaller and heavier horse. As a result, a type of Friesian horse emerged that was different from what we like to see today; what now want is to have back the original luxuriant long lines of its forefathers. In the sixties the next crisis in breeding ensued. The mechanisation of farm operations made the horse redundant. Most farmers lacked the money to keep a horse for pleasure only, which meant that the horse disappeared from the farm yards. In 1965, only some 500 mares were registered in the studbook.3 Fortunately there were now also great lovers of the breed, who brought the horse to the attention of other individuals, many of whom had not been raised with horses. In 1967, the national riding association ‘De Oorsprong’ began a crusade through the Dutch province of Friesland to promote the Friesian horse. From 28 March to 1 April a parade of lovers of the breed travelled with their Friesian horses from Huis ter Heide to Workum. The impact of the promotion campaign was evident in the rapid expansion of the breed in the two ensuing decades. Many people discovered the fabulous characteristics of the Friesian breed and put the Friesian horse to use for many and varied purposes. Anno 2007 more than 40,000 horses are registered by the KFPS and some 7,000 breedings are documented every year.